1Laboratorio de Referencia del Programa de Control de Tuberculosis de la Provincia de Buenos Aires, V. López; 2Hospital Petrona V. de Cordero, San Fernando; 3Programa de Control de Tuberculosis, Distrito Buenos Aires Norte, V. López; 4Hospital Dr. Cetrángolo, V. López; 5Instituto de Biotecnología, Instituto Nacional de Tecnología Agropecuaria (INTA/CICV) Castelar, Buenos Aires, Argentina; 6National Institute of Public Health and Environment (RIVM), Bilthoven, The Netherlands. 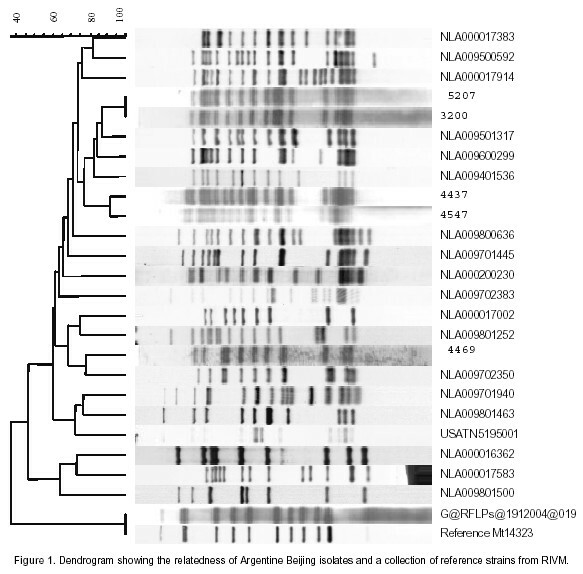 During a population-based study to genotype isolates of Mycobacterium tuberculosis from Buenos Aires Northern suburbs, we found isolates with molecular patterns related to those of the Beijing genotype. Five out of 590 (0.85%) patients had isolates with spoligopattern identical to that of the Beijing family. Since two of these isolates showed identical IS6110RFLP pattern, we found only four different patterns containing 11 to 19 bands. The isolates were obtained from young people (including a 7 years-old child) who were born in Argentina, and were living in a small area of our region. However, conventional contact tracing did not prove epidemiological linkage among them. These isolates were fully drug-susceptible to the first-line drugs. The comparison of the IS6110RFLP patterns from our isolates against a set of 19 reference Beijing patterns from the RIVM (The Netherlands) confirmed that the strains belonged to the Beijing lineage. These findings might be partially explained by the important migration phenomena occurred during the last decade. Further surveillance studies would help in the following of Beijing family strain dissemination in our community. Primera descripción del genotipo Beijing de Mycobacterium tuberculosis en la Argentina. Durante un estudio poblacional para genotipificar aislamientos de Mycobacterium tuberculosis de Gran Buenos Aires Norte, se encontraron aislamientos con patrones moleculares relacionados con el genotipo Beijing. Cinco de 590 (0,85%) pacientes tuvieron aislamientos con un patrón de spoligotyping idéntico al de la familia Beijing. Dos de esos aislamientos mostraron un patrón de IS6110 RFLP idéntico, por lo que finalmente fueron encontrados cuatro patrones diferentes conteniendo entre 11 y 19 bandas. Las cepas fueron aisladas de personas jóvenes incluyendo un niño de siete años de edad, todos ellos nacidos en Argentina y residentes en un pequeño distrito de nuestra región. Sin embargo, no pudo hallarse ninguna conexión epidemiológica entre ellos. La comparación de los patrones de IS6110 RFLP de los aislamientos con un panel de 19 cepas Beijing de referencia del RIVM (Holanda), confirmó que estas cepas pertenecían a ese linaje. Estos hallazgos podrían explicarse, parcialmente, por el importante fenómeno migratorio ocurrido la pasada década. Futuros estudios de vigilancia epidemiológica podrían contribuir en el seguimiento de la diseminación de las cepas de la familia Beijing de M. tuberculosis en nuestra comunidad. Molecular techniques for characterisation of Mycobacterium tuberculosis strains have been used for more than a decade to describe and study molecular epidemiology of tuberculosis (TB) (21). Restriction fragment length polymorphism (RFLP) based analysis using IS6110 was used to trace-back transmission in hospitals, prisons and other institutional outbreaks, in identifying cases of unsuspected transmission, in tracking cases of laboratory cross-contamination, in discriminating exogenous versus endogenous infection and in demonstrating the occurrence of exogenous superinfection in both, immunocompetent and immunocompromised hosts (1, 5, 6, 8, 17, 19, 21). Spoligotyping, a PCR-based method for typing M. tuberculosis complex isolates, is also useful in distinguishing between different subspecies and genotype families belonging to this complex (7, 10, 11, 21). Beijing genotype family of strains was extensively studied by RFLP and spoligotyping, particularly, the multidrug-resistant (MDR) "W" variant of Beijing strain which has also been associated with several outbreaks world-wide (3). Strains from the Beijing family are highly epidemic and the disease they produce is being transmitted in Asia and Eastern Europe. Besides, the highly drug-resistant Beijing clones have also caused several outbreaks in the rest of the world (2, 4, 9, 13). The widely distributed association of drug resistance and the Beijing genotype suggests that these strains may have a particular propensity for acquiring drug resistance (9). Recently, it was reported that Beijing strains carry mutations in putative mutator genes and this may explain a higher adaptability of these bacteria to stress-conditions such as exposure to antituberculosis drugs and the hostile intra-cellular environment (18). Furthermore, studies in a BALB/c mouse model demonstrated a lower efficacy of BCG vaccination against infections by Beijing genotype strains (14). During a population-based study to genotype M. tuberculosis isolates from Buenos Aires northern suburbs carried out from January 2001 to December 2002, 5 out of 590 (0.85%) M. tuberculosis isolates had Beijing-type spoligotypes (12). This pattern is characterized by hybridization with the last nine spacers (35 to 43). IS6110 RFLP patterns of the local Beijing isolates (5207; 3200; 4547; 4469 and 4437) are shown in Figure 1. Patterns were analysed by using the software Bionumerics (Applied Math, Kortijk, Belgium), applying UPGMA clustering method, the Dice coefficient for band-based similarity, and 1% band position tolerance. Four different IS6110 RFLP patterns containing from 11 to 19 bands were found. Isolates 5207 and 3200 were highly similar. The 5 Beijing strains were isolated from young people (16, 20, 21 and 24 years old) including a 7-years-old child. All patients received BCG vaccination at birth according to the national policy. All these patients were born in Argentina, and were living in San Fernando, a small district of northern suburbs of Buenos Aires City. However, conventional contact tracing did not prove epidemiological linkage among these patients even in the child case. The comparison of the IS6110 RFLP patterns against a set of 19 Beijing reference strains at RIVM confirmed that the five isolates studied belonged to the Beijing lineage (Figure 1). Strain 4469 is the most distantly related. None of the strains described here matched 100% to reference patterns. Strains 5207 and 3200, which have identical patterns, matched with 90.3% similarity to Beijing reference patterns 9600299 and 9501317. Strains 4437 and 4547 have a very similar IS6110RFLP pattern. Strain 4437 pattern matched with 87.8% similarity to Beijing reference 9500592. Finally, the pattern of strain 4469 matched with 78.3% similarity to Beijing reference strain 9702350 (data not shown). The isolates tested by microbiological methods were fully susceptible to the antituberculosis drugs (data not shown). Furthermore, the analysis of the rpoB (16) gene showed hybridization signals only with the wild type oligonucleotides (data no shown). As it was pointed out previously, and on the basis of spoligotyping, hybridization with the last nine spacers (35 to 43) was 100% specific to recognize Beijing genotype strains (12). In our study, the RFLP divergence observed could indicate that the infection was not directly transmitted among the cases studied here, and that some epidemiological links are lacking in our study. On the other hand, we were able to verify that the patients belonged to the middle-income social class in Argentina, and they declared no travels abroad. The low number of cases and the fact that Beijing pattern was not previously observed (1, 19), suggest a relatively recent introduction and transmission of Beijing family strains in Buenos Aires City region. On the other hand, the fact that the cases were young people suggests an active transmission in the community. The findings of Beijing M. tuberculosis family might be partially explained for the important migration, phenomena occurred during the 1990s decade. People from Asia as well as from others Latin American countries found a job and established their residence in North Buenos Aires City suburbs. As it was confirmed by several previously published studies, M. tuberculosis with Beijing genotype is the predominant causative agent of TB in Asia from where it seems to have spread through several regions around the world (2). Further surveillance studies would help in the comprehension of the Mycobacterium tuberculosis Beijing family strain dissemination in our community. Acknowledgements: This study was partially financed by the European Commission, project ICA4-CT-2001-10087 and the Roemmers Foundation, Argentina. Projects year 2000-2002. We would like to thank the technical assistance of Belén Imperiale, Marcelo Mazza, Daniel Cardinali and Zuni Zubov.